If this is what bugs look like on New Genesis, they must wreak havoc on weekend barbeques. Forager was born among the "bugs" beneath New Genesis - evolved humanoid insects scattered there as biological weapons years ago by the armies of New Genesis' rival planet, Apokolips. Forager's forays to steal food from the surface world ultimately broguht him into contact with Orion and Lightray of New Genesis, and helped them prevent one of Darkseid's most fearsome servants, Mantis, from exterminating all bugs. Forager is, like Mantis, a character so ragingly obscure that the only reason I'd ever heard of him before this review was that Rustin covered him in a different article. If this is the way the line is going, DCUC15 - the one whose lineup is embargoed until May 15th - is going to be the Forgotten Villains with Ultivac, the Indestructible Computer That Walks Like A Man, as the BAF. Forager uses the more slender male body, though you may not be able to tell it at first glance, thanks to this series' remarkable use of new parts. For instance, he's wearing a soft rubber skirt, as well as a pseudo-tunic/shawl that not only provides little shoulder flaps, but also bulks up his chest slightly, effectively changing the silhouette and keeping him from looking like yet another cheap repaint. He has a separate blue bandolier and thick wristbands, and the right band is molded with some sort of blaster or spewer or something that runs along the forearm. And in the most unexpected bit of detail on the whole thing, the bottoms of his feet are new sculpts. Good gravy, man! The head is new, obviously; Forager has a very boxy, cylindrical noggin, completely unlike any other character. The wrinkles suggest it's some kind of mask, but then it also clings perfectly to his open mouth. Sure, that sounds weird, but doesn't Mister Miracle's mask do the same thing? He has a white construct on his face that seems to serve as a combination of goggles and nose protection. It has two small antennae in the center, and the diamond-shaped eyes are golden. Paint is okay, though there are a few problems to watch out for. Instead of white, his clothes are a very pale gray. The blues are solid, and the match between painted and molded pieces is good. 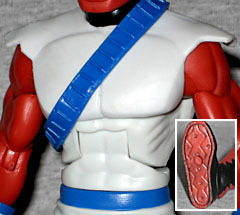 Forager's body is brick red, and the jagged black patterns on his legs match the ones sculpted on the soles of his shoes. Wrapping those black edges around uneven anatomy makes for a few problematic spots where things don't quite want to line up, and there are at least a few points that are fuzzy. Still, for the most part, this is good work you don't need to worry about. Forager has one accessory, his shield. It's something both toys have had, and was even part of his Superman: The Animated Series character model, so it must be somthing that matters. You'd have to ask someone who's familiar with Forager, and since nobody is, that's the end of that. It's 2⅜" in diameter, and has a sculpted symbol of some sort on the front. Three separate straps hold the shield to his arm, and they're sculpted to look like leather. 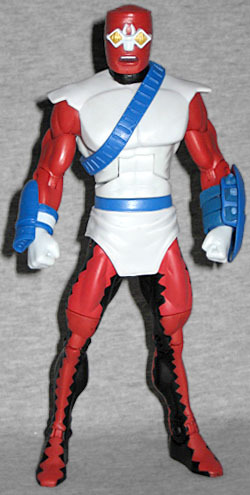 Forager comes with two pieces of the Series 10 Build-A-Figure, Imperiex. He gets the head and crotch, a common pairing the way BAFs are split these days. The hips are solid black, but the head is a lot more colorful: gold trim, pink skin, red eyes and a maroon tassel sticking out the top. Kind of a goofy look, to be sure, but it's accurate, as far as I can tell. Forager is pretty much a perfect choice of a character for this Wal*Mart-exclusive series: sure, he's going to be hard to find, but nobody gives two craps about him, so who cares? If you can find him (and you can - he's one of the two pegwarmers from Series 10) he's a fine figure, but if you can't, it's no great loss.